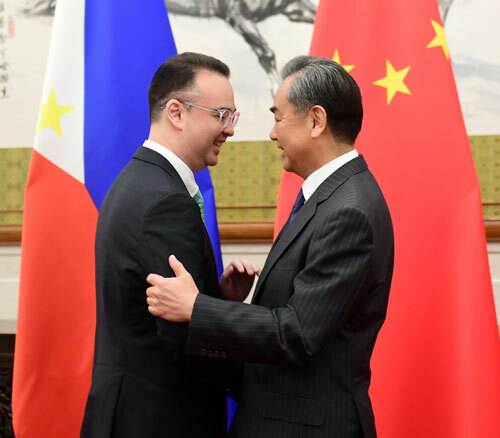 On August 22, 2018, State Councilor and Foreign Minister Wang Yi met with Foreign Secretary Alan Peter Cayetano of the Philippines who was in China for meetings. Both sides had in-depth communication on ensuring the continued, stable and sound development of China-Philippines relations. Fully recognizing the positive progress in China-Philippines relations, both sides believed that it completely conforms to the common interests of the two countries and the two peoples, and that enhancing mutual trust is of vital importance. The two sides stand ready to actively promote various departments of the two countries to strengthen exchanges at all levels, increase understanding, and consolidate as well as deepen mutual trust. Both sides believed that the enhancement of high-level exchanges plays an important guiding role in the development of bilateral relations, and agreed to make joint efforts to well prepare for bilateral high-level exchanges in the next stage. Considering that the Philippines has taken up the post of the country coordinator for relations between China and the Association of Southeast Asian Nations (ASEAN), both sides also agreed to jointly advance China-ASEAN comprehensive strategic partnership, continue implementing the Declaration on the Conduct of the Parties in the South China Sea in a comprehensive and effective manner, and promote consultations on the Code of Conduct in the South China Sea in an active and orderly manner, so as to jointly well safeguard the peace and stability in the South China Sea.